Hi! I made this ATC (Artist Trading Card) to participate in Verve's July Project Parade Challenge. I made the torn paper rose the same way as in my last post. The leaves are also shown in the video I linked last time. This time I used a button for the center, and followed a tip I have seen on multiple blogs to 'thread' the button with a thin strip of paper. The white background is embossed with a Cuttlebug folder. Happy was created with a rub-on sentiment and Birthday was created with a Tape Writer. This is the card I made from the ATC. I gave it to my mom for her birthday. 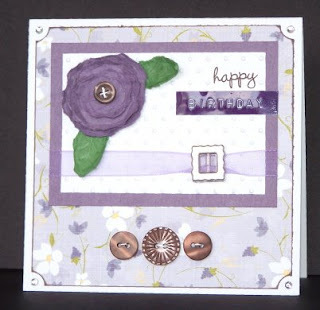 She loves purple and she loved this card. The rest of the card was pretty simple to make. 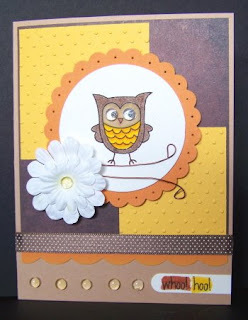 I used some elegant Chatterbox paper as a background with the corners punched with the Ticket corner punch. To make the edge of the patterned paper stand out, I applied some Chestnut chalk ink direct-to-paper. 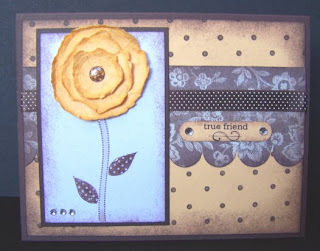 I added some more paper-threaded buttons to connect with the details of the ATC, and finished off the card with tiny stick-on rhinestones by Me and My Big Ideas. Perfect Plum, Garden Green, and GP white cardstock, Cuttlebug Swiss Dots embossing folder, Foofala buttons, organdy ribbon, Joann's brand ribbon buckle, Crate rub-on, tape writer, Chatterbox patterned paper, Colorbox Chestnut chalk ink, Me and My Big Ideas rhinestone stickers. I was inspired by many sources while making this card. First, I knew I wanted to use Julee's Mojo sketch. Then while browsing Our Creative Corner's inspiration photo, I thought of the torn paper roses I had seen Julie make at her blog. All those things came together to make this card. So to make the rose, just click the last link to view her video. For the bottom of the rose, I stamped the stem from Verve's Petals and Stems, and went over it with Diamond Glaze. The center of the flower is also from that set, and covered in Diamond Glaze. Everything else is pretty self-explanatory. All the edges were sponged in Basic Brown, the scallops were made with the slit punch, the background was stamped with the Polka Dot stamp, and the sentiment is a Crate paper rub-on. This card I made for Taylor's weekly cupcake challenge. 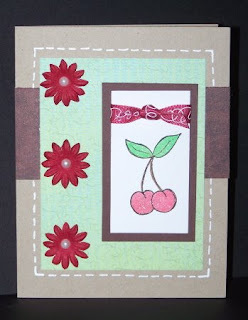 I hadn't stamped with these cherries yet, so I thought I'd give them a try for this sketch. I see now that I made the green panel too large, that happens sometimes when you hand-draw the sketch to try to remember it. Anyway, the cherries are colored in with Stardust pens and have a nice sparkle to them IRL. I tied a bow across the top and then matted it with Chocolate Chip cardstock. The green layer is from the new Basic Grey Euphoria - it does have a faint pattern, hard to see in the photo. Next, I stuck on some Primas and used a scrap of Basic Grey Sultry for the bg panel. The edge of the Euphoria was looking too plain, so I added some faux stitching. Pretty simple card overall! Hero Arts cherries stamp, Versafine black ink, Kraft cs, GP white cs, Chocolate Chip cs, Basic Grey Euphoria and Sultry 6x6, Sakura Stardust pens, American Crafts ribbon, Prima flowers, K & Co adhesive pearls, Uniball Signo white gel pen. 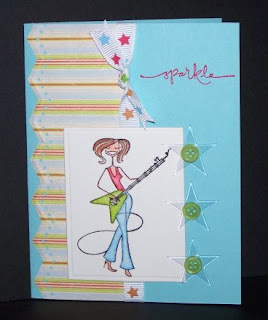 Here's a card I made today, for the Verve challenge to create something with stars on it. I don't have any stars big enough for a focal image, so I thought about what would go with stars. This rock-star Bella came to mind so I got to work. I knew I wanted to use the fun star ribbon, so I colored the Bella in the same colors as the stars on it. The photo doesn't show it, but the guitar is covered in Diamond Glaze so it shines. I used my Nestabilities again to cut her out. The embossing shows a little better on this one. Luckily, this Romani Basic Grey paper also matched the colors, so I pulled out my new Martha border punch to accessorize the edge. I love how it embosses! The ribbon was tied on the other side to hide the seam (and show off the stars!) and then I embossed the sentiment with some red ep. I got these fun Heidi Swapp Ghost stars just for this challenge. To attach them, and hide the glue, I stuck a button on top of each star. Then when I stuck a glue dot to the star itself, the button hides the glue...plus, I just like the way it looks! If anybody reads this blog...Hi, strangers! It's been awhile since my last post, but thats mostly because my mojo took a vacation for awhile - I wish it had taken me along, I could use one of those! Anyway it's back and I made this card earlier in the week for my friend's birthday. She loves all things bee related, so I knew what I wanted to stamp for her. Also, if you can't tell, the sentiment is a play on B-day, the shortened version of birthday. This card was pretty simple to make. I got to use my new Nestabilities for the bee image! It is embossed though the camera barely picked it up. The bee image looks slightly crooked in the photo, but it looked better IRL. The bee was colored with a marker and the wings were filled in with Waterfall Stickles. The fun daisy paper worked really well with the bee, I thought, and I like the Build-a-Brad that I made with the same paper. I just colored the patterned paper daisy with the same marker as the bee and punched out the center...looks cool, huh? The sentiment was created with tiny alphabet rub-ons. Thats pretty much all there is to this card. If you wanna know the size, this one and pretty much any square card I make is 4.25" square. 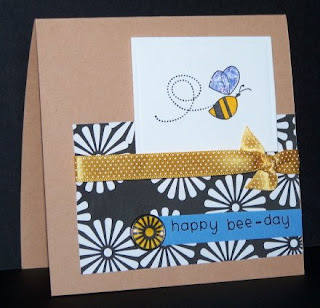 Bee by Inkadinkadoo, GP white cardstock, creamy caramel cardstock, making memories patterned paper (found at Target), Archiver's blue cardstock (has a texture),Versafine black ink, So Saffron marker, Waterfall Stickles, American Crafts ribbon, SU build a brad, 1/2 in. circle punch, Large rectangle Nestabilities, Doodlebug rubons. Today I'm sharing with you a couple cards I made for some blog contests. This first one is for Taylor's cupcake sketch challenge, here. As her expression goes, "You don't have to use cupcakes for the challenge, but if you got 'em, why not use 'em!" Well I looked and I guess I don't really got 'em! (Although, I really want the Hey There, Cupcake set by Stampendous.) Anyways, I thought these Elzies were just as cute as cupcakes! I started by stamping the Elzybells image and coloring it in with Prismacolors and Gamsol. The circle was cut out with my Coluzzle and the mat was punched with a Giga Marvy punch. I wanted to make it *pop* a little so I pierced around the punch-out and adhered some Dew Drops around the frame. For the base of the card, I chose some Basic Grey paper from the Blush 6x6 pad, (I had colored my Elzies to match) and after it was glued down, I scored two lines on each side with my new toy, the Scor-Pal. I stamped the sentiment with a Studio G alphabet and then added some polka dots to it with the fine point end of a Regal Rose marker. It was then punched with a Word Window punch. For the finishing touches, I added a brad to the sentiment and tied around this fun polka-dot ribbon. I think I'll send this card to my sister, to let her know I'm thinking about her! My second card was made for a mojo sketch challenge over at Julee's blog, here. I knew I wanted to use this cute little owl, so at first I stamped him and then picked out some markers to color him in. On my GP cardstock, the markers looked awful. So I got out some watercolor paper, and found that the difference was amazing! No streaks on the watercolor paper! I also tried to add in the Splicoast Ways to Use It challenge to use wire. My idea was to make this little guy a branch to stand on. It took a couple tries to get it to look right...but I think it turned out really cute! If you're wondering how I attached it, I just stuck the ends onto some Zots glue dots and covered the spot with the flower. Again, I cut out the circle with my Coluzzle and then matted it with a Giga Marvy scalloped circle punch-out. I really liked the piercing from before, so I added it to this one as well. Then I started on the background. The bottom layer is just one of the plain color sheets from the Basic Grey Sultry pack. Then I layered on the Summer Sun that had been embossed with the Swiss Dots Cuttlebug folder. Some more fun polka-dotted ribbon, a scalloped border made with my corner rounder, and the marker-highlited sentiment rounded out the layout requirements. For fun, I added a line of Dew Drops to the bottom, as well as one for the flower center, and two clear drops for the owl's eyes. Elybells Hugs stamp by A Muse, Studio G alphabet, Versafine onyx black ink, GP white cardstock, Cool Carribean cs, Creamy Caramel cs, Basic Grey Blush 6x6 patterned paper, Prismacolor Pencils and Gamsol, Lily Pad Dew Drops + Zots, paper piercer, American Crafts ribbon, Scor-pal, Word Window punch, silver brad, Regal rose marker, Coluzzle and Marvy Giga scallop circle punch, pop dots. Just Celebrate SU stamp set, Versafine Onyx Black ink, SU watercolor paper, Pumpkin Pie cs, Summer Sun cs, Creamy Caramel cs, Basic Grey Sultry 6x6 patterned paper, SU markers in Creamy Caramel, Close to Cocoa, Summer Sun, and Really Rust, brown wire, Coluzzle and Marvy Giga scalloped circle punch, paper piercer, Making Memories paper blooms, Lily Pad Dew Drops, Cuttlebug and the Swiss Dots embossing folder, American Crafts ribbon, Word Window punch, pop dots. I love to do challenges. 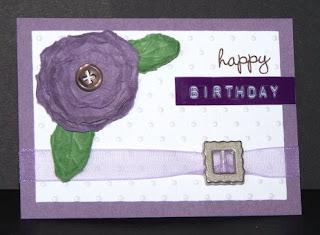 Everytime I come across a challenge in my blog-hopping I make a note of it, and if I have time I try to get a card made. Well, this time the challenge is on Kim Hughes blog, and she is giving away a stamp set that she created for Cornish Heritage Farms. Her challenge was to use 2 of the colors - red, white, and blue (because of Memorial Day). I chose blue and white. 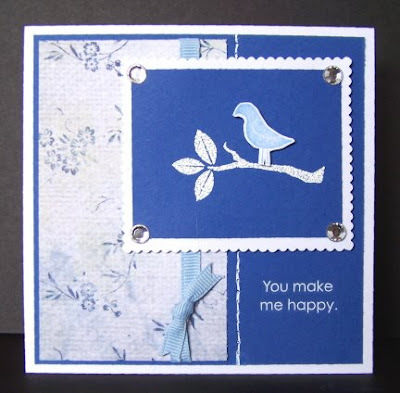 I started this card by stamping the branch in White Craft ink and heat embossed it with white embossing powder. Then I stamped the bird on a seperate piece of white paper and cut it out. I wish my camera showed the detail better, because the bird is lifted up on a pop dot. After that, I mounted the whole piece on white cardstock and cut around with scalloped edge scissors. As an afterthought, I added the rhinestones to the corners. The rest of the card is pretty self-explanatory except for a couple things. First, the entire bird layer is also popped up. Secondly, the sentiment is a rub-on. Lastly, the faux stitching was done with the mat pack from Stampin' Up and a Signo white gel pen. My name is Christina - a.k.a. thecardpixie on Splitcoast Stampers. Here I will hopefully convey the "magic" I find in stamping and creating...and maybe some fun tidbits from other parts of my life!